The chapter describes institutional and gender relations in the society and the economy, the influence of institutions and the state that may lead to the institutional change, which is understood as an adaptation of habits of thought to changing circumstances. The situation of women in Poland has been chosen to illustrate this phenomenon. Poland, as a country, has gone through major social, political and economic transformations in the last 25 years, and they have had important impacts on people's lives. The analysis of the impact of major transformations in Poland's post-war political economy enables the distinguishing factors (policies, institutions) that guarantee certain continuity in a society, and the ones that lead to institutional changes. Knowledge about the mechanisms of institutional change in the context of gender relations is helpful in designing policies aiming at promoting gender equality in societies as well as economies. Institutionalists, a group of economists whose roots might be traced to as early as the 19c., are united by shared believes even though seemingly they form a rather diverse group of scholars. The institutionalist concept of society is holistic in nature, in other words social reality is viewed as a unified whole. Institutionalists view society from a ‘processual’ perspective. This means they view social systems as dynamic, ever-developing entities, and are aware that all social activities occur in both historical time and an environmental uncertainty regarding the future. According to Wilber and Harrison (1978), “social reality is seen as more than a specified set of relations; it is the process of change inherent in a set of social institutions which we call an economic system” (p. 71). The Institutionalists’ view on society and the economy is systemic because they believe that parts of the system make up a coherent whole and can be understood only in terms of the whole (Wilber & Harrison, 1978, p. 71). It is also evolutionary because changes in the pattern of relations are seen as the very essence of social reality. Foldvary (1996) adds to this perspective that institutional economics is historically grounded, the economy exists in real, historic time, not in an abstract, timeless equilibrium. Every economic activity involves a process in which the economy moves constantly from a well-known past, through the present, and into an unknown future (W.C. Peterson, 1994, 29). Institutional Change: An adaptation of the way of thinking to new circumstances. Institutional Economics: A school of economic thought that recognizes the role of institutions in shaping economic relations and the society. Gender: A socially assigned role to women or men that attributes social meaning to biological differences between sexes. 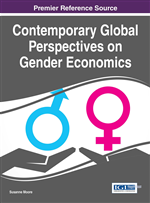 Gender Economics: A research programme, which main objective is to include gender in economic analysis. System Transformation: The political and economic transition from the command economy in the socialist state to the market economy in the democratic state, that started in 1989 in Poland. Institution: A rule, and a way of behavior, known to each member of the society because of their everyday use. It is a collective action that controls individual’s activities, and it is a widely recognized social norm.